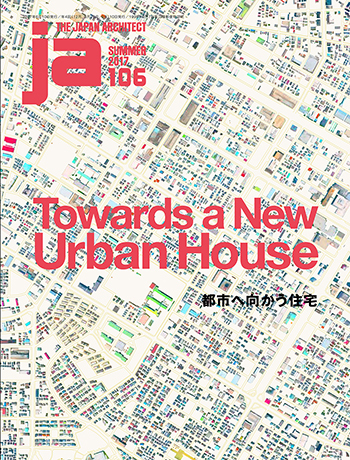 JA106 is a special issue on houses and the city. It is an attempt to capture the current moment in Japanese houses via an investigation into their attitude toward the city. For each of 13 houses completed since 2010, it asks how this house views the city and how it responds to the city.Houses have turned towards the city in ways never seen before. These houses may represent not only the reality of new urban life styles but also the possibility of creating new urban houses and new cities by approaching the city from the house. Office of Kumiko Inui + Tokyo University of Arts Inui Lab. + Ryugo Ichikawa 2. Satoko Shinohara / Spatial Design Studio + Ayano Uchimura / A Studio12. Junya Inagaki + Satoshi Sano + Takuo Nagai + Eisuke Hori / Eureka13.